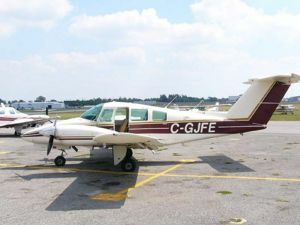 The Beechcraft 76 Duchess was a twin-engine development of the Beechcraft Musketeer, and was designed as an economical twin-engine trainer to compete with the successful Piper Seminole. By sheer coincidence, and in accordance to the "form follows function" rule, the two aircraft appear to be nearly identical. The Duchess was equipped with the same 180-hp Lycoming engines as the Seminole. Due to the relatively low-powered engines, and the rather heavy construction of the Duchess, many student pilots find that the aircraft is under-powered and as a result a challenging trainer, especially for engine-out training. This has lead to the derogatory epithet "Gutless Duchess" being applied to the aircraft. Unlike the Seminole, which is still being produced today, the Duchess is no longer in production. 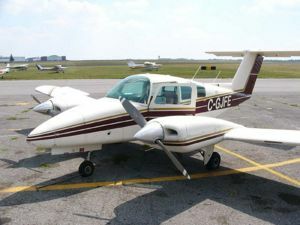 Large numbers remain in use in flight schools around the world. This page was last edited on 5 March 2007, at 19:53.